The annual Fete and Donkey Derby was held on 28th August 2017. The lively donkey races provided plenty of entertainment in blazing sunshine! The North Downs Community Orchestra performed at the start of the event with a rendition of classical and popular tunes conducted by Richard Cross. Their performance was followed by a splendid gymnastics display before the commencement of the six donkey races. There was plenty of other entertainment in the form of Giles Musical Organ, stalls of all kinds, plenty of ice cream, and the shrieks coming from the vicinity of the Punch & Judy show was ample evidence that the young ones were having lots of fun! The annual Dog Show was also a great success. We hope to see you at the next event in August 2018, planning for which is already underway! 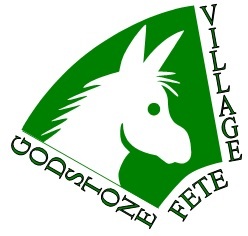 A presentation evening was held at the Godstone Village Youth Centre in October to distribute the proceeds of the Fete in the form of grants to local organisations and charities, and as a thank you to all those that contributed to the success of the event. Godstone Fete would like to thank the following organisations for their kind and generous donations in 2017. * William Way (Godstone) Ltd.